Accelerate Your Career and Professional Development! 4 magical days of MBA skills training and networking with legendary natural foods leaders… for the new generation of leaders in food and CPG. As of July 1 we are sold out, but you can add your name to the waiting list here. the Food (& CPG) Industry Executive Leadership Development program. It’s the first MBA-level executive education program designed by and for the natural foods industry. Geared for the new generation of food and CPG senior leadership, our unique format is unlike any other executive education program in the country. It combines theory and practice side by side in a team-taught setting, offering participants both MBA-level coursework and a deep dive into the tactical, practical world of running a natural products business. It marries the best of graduate business education with the pragmatic real-world experiences of practitioners – all filtered through the lens of the natural products industry’s one-of-a-kind culture of entrepreneurship, disruption, purpose-beyond-profits, and explosive triple-bottom-line growth. 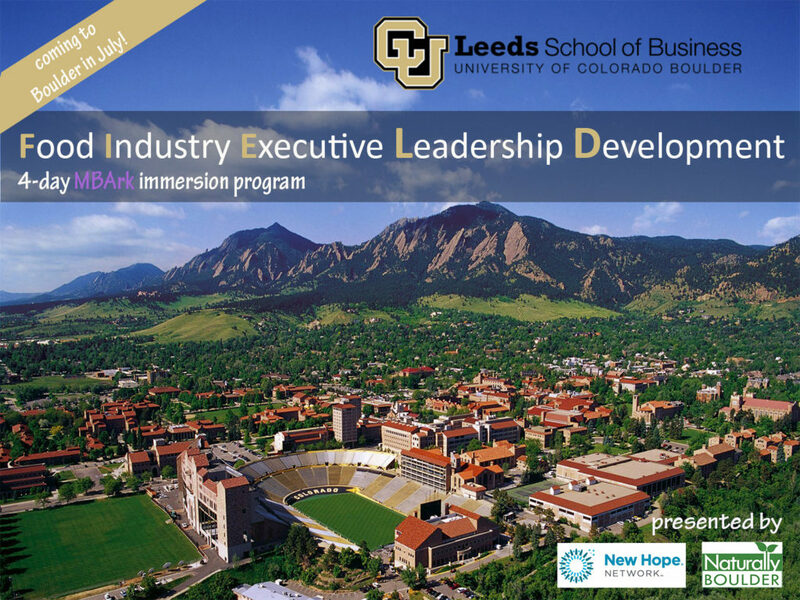 The program also provides an unprecedented chance to network with others in the industry, to experience the best of Boulder’s “living laboratory” of natural products companies, and to build ongoing specialized learning through webinars and online courses available only to those who have earned the certificate for completion of the in-person immersion.